I'm not a comic guy; most of my literature intake comes from audiobooks. I've picked up a few over the years, but what few I've kept - Atari Force, Karate Fighters, Bionicle, etc. - isn't for their artistic value. 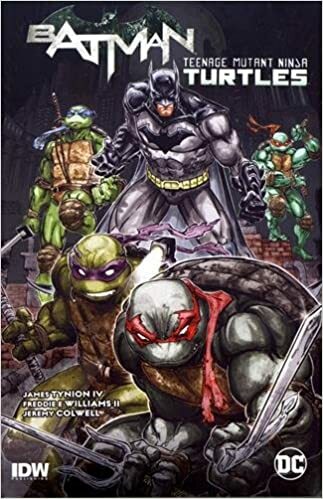 Batman/Teenage Mutant Ninja Turtles Vol. 1 was the first to truly win me over, and Vol. 2 is the first I'll actively purchase. I'm not a comic expert, but the reviews are a testament to its quality. What I am is a nostalgic sucker for polished simplicity; this crossover is perfect for me. 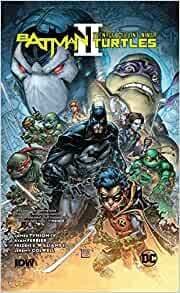 The art style is more serious than I'd like, but is still easy to appreciate for its depth, while the story is rife with vintage-feeling villains and plots, perfectly scratching my itch for my childhood TMNT and Batman animated series. Maybe most importantly, I received this volume as a parting gift from a former coworker. This friend based her purchase solely on passing conversations with me, and she struck gold outside my mediums of choice. I'll never forget the gesture or Grade-A selection, and am literally looking forward to the next chapter. For a true review, I recommend this 55-minute-long take from ComicPOP if you have the time for great detail and good comedy, or this quick, positive look from ChiGuy if you don't. Before making this post, I got a thorough refresher on Vol. 1 from Comicstorian; his channel is packed with 10-20 minute, highly detailed "summaries" of popular comics, and it makes for great listening at work or on the road.